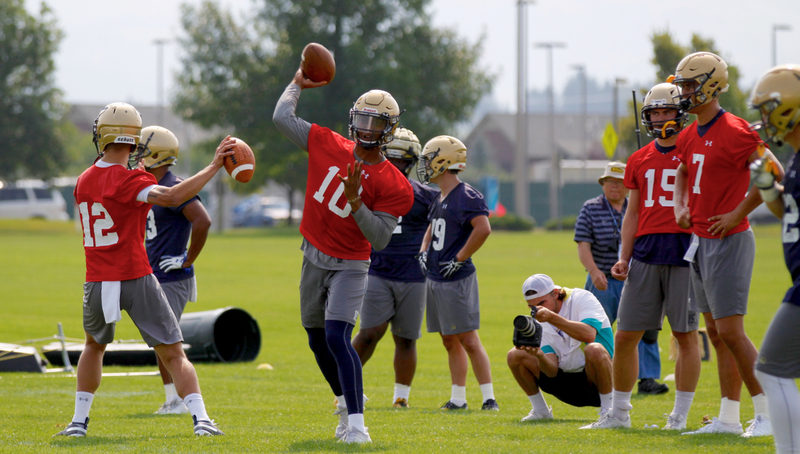 BOZEMAN — By all accounts, Montana State’s defense has worn out the MSU offense for the first week of fall camp in Bozeman. A unit that returns veterans at all three levels and added a glut of talent from the transfer ranks in the off-season has predictably held the upper hand against a Bobcat offense in search of a new quarterback, not to mention position battles at running back, wide receiver and the right side of the offensive line. On the eighth day of fall camp, the Bobcat offense swung back successfully. 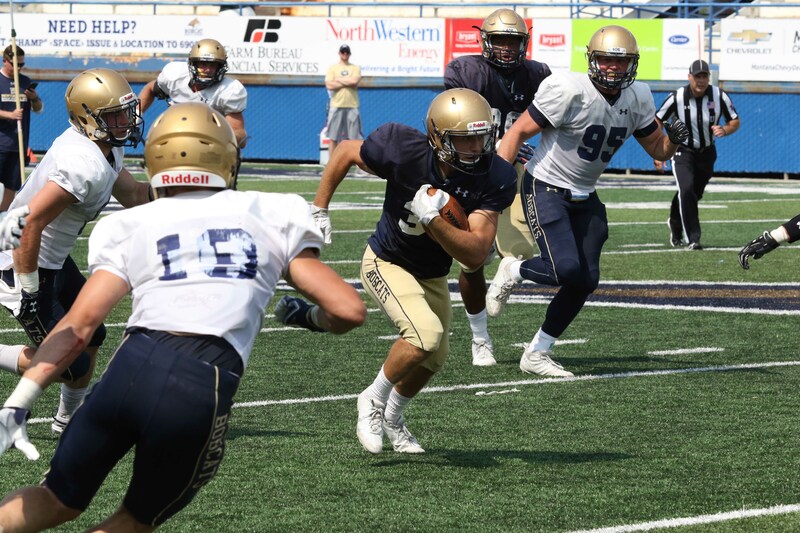 In a scrimmage that MSU third-year head coach Jeff Choate estimated lasted “80 or 85 plays” on a Saturday afternoon where temperatures reached 98 degrees at Bobcat Stadium, the Montana State offense marched 65 yards in “13 or 14 plays,” according to Choate, capped by a one-yard touchdown run from junior Tyler Natee on the opening possession of the session. The roughly 100-minute scrum was closed to everyone but MSU Quarterback Club members and players’ parents, so the recollection of the events came from Choate. 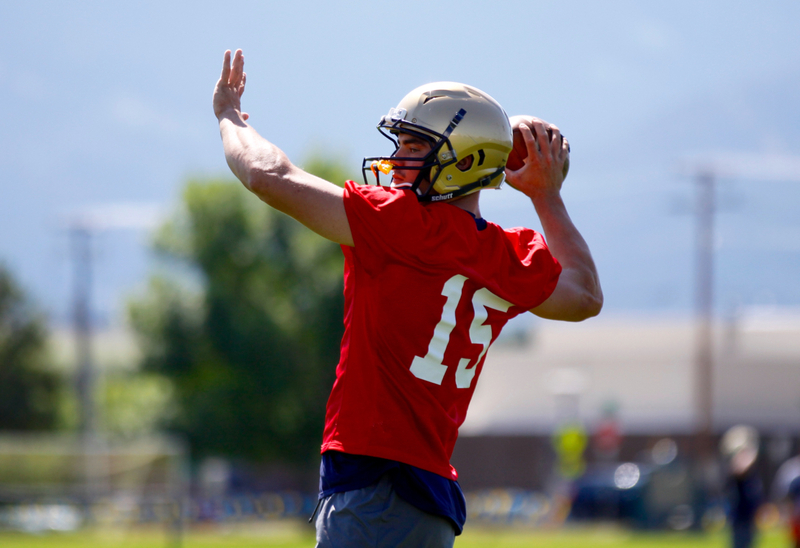 Montana State’s skipper said he liked the offense’s response after a week of practice in which the defense held firm control. “One week into camp, I feel pretty good about things,” Choate said. “We were able to operate at tempo. I thought our communication was good between our coaches and players was good. That’s one of the biggest things I’m paying attention to: are they keeping their poise and getting the next call in. 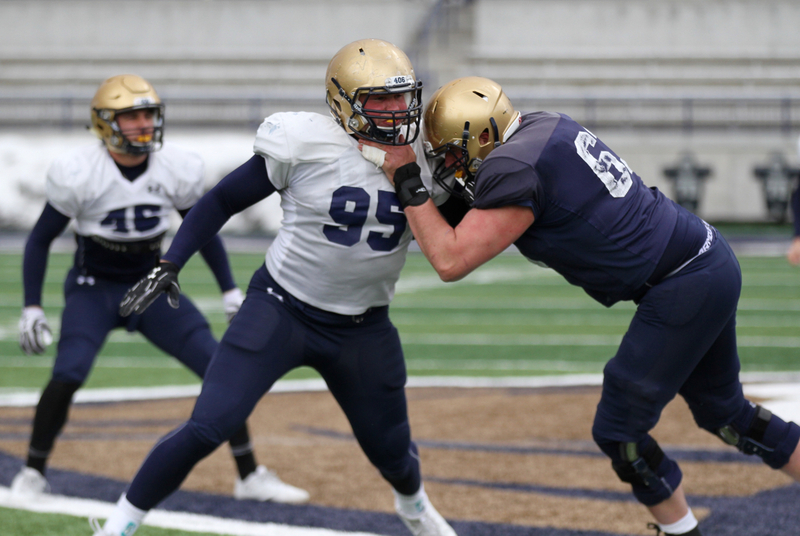 Throughout this camp — which will culminate with next week’s Saturday scrimmage before game prep for the opener against Western Illinois in Bozeman on August 28 commences — the dominant story line has been the battle to start under center. With Chris Murray taking the 2018 season off to concentrate on academics, a four-way battle between junior Travis Johnson, sophomore Troy Andersen, redshirt freshman Tucker Rovig and true freshman Casey Bauman has raged for the first week. Choate has repeatedly said he hoped to find clarity and start getting more reps for the clear-cut No. 1 and No. 2 in the QB pecking order following Saturday’s scrimmage. Andersen and Jonsen each wore red non-contact jerseys and took all the first-team repetitions, Choate said. Rovig took the second-team snaps, Choate said. “Most of the people that were here, the Quarterback Club members, they will see that there is two guys wearing red jerseys and the other guys are wearing blue jerseys,” Choate said. “I think there is the ability for us to truly evaluate those guys today and establish that depth chart. It’s really just been a seating chart up to this point in time. Now we have to start saying, here’s who’s rolling with the 1s, here’s who is rolling with the 2s. If you are a 3 and you need to be a 2, do what you need to do to be able to do it. This week of camp will be solidifying that depth chart because that following week, it will be time to prepare for the season. According to the statistics provided by Montana State sports information, Andersen completed 4-of-6 passes for 26 yards and rushed six times for 16 yards. Jonsen completed just one of his four pass attempts for 10 yards but rushed three times for 13 yards, including scoring an eight-yard touchdown, the longest TD of the day. Choate said the first-team offense operated with Andersen and Jonsen on the field at the same time quite a bit, especially during the red-zone portions of the scrimmage. “I thought there was some times in the red-zone section where Troy and Travis together on the field at the same time in a variety of spots was really a problem for the defense,” Choate said. Another key offensive story line this camp has been MSU’s variety of options at running back. MSU added Natee to the fold in January, one of four transfers along with Jonsen, kicker Tristan Bailey and defensive end Bryce Sterk signed. The 6-foot, 260-pounder defines short-yardage back. The Bobcats also switched junior wide receiver Karl Tucker II to running back in the spring. The Great Falls CMR product has struggled with a pulled hamstring this camp. Sumner, a 5-foot-8, 183-pound former Montana Class B state 100-meters champion at Huntley Project, also impressed. He rushed seven times for 35 yards. If there was one thing Montana State could’ve done better, Choate said, securing big plays came to the forefront. The head coach said MSU had plenty of opportunities to break things open but it simply came down to physical execution. The only turnover came when redshirt freshman safety Keaton Anderson stripped a ball carrier. Rovig had the most action working with some of MSU’s talented young skill players. Redshirt freshman Coy Steel caught six passes for 59 years, each scrimmage highs. The former Wyoming Gatorade Player of the Year also rushed twice for 11 yards. True freshman wide receiver Mekhi Metcalf caught four passes for 21 yards. Sophomore Tyrel Burgess carried the ball three times for 21 yards and caught a pass for a gain of five. Defensively, junior defensive ends Marcus Ferriter and Derek Marks, true freshman linebacker Nolan Askelson and true freshman defensive tackle Seer Dienes had sacks. Sophomore linebacker Callahan O’Reilly and junior defensive end Bryce Barker each had tackles for los. Senior Grant Collins, the slated starter at Mike linebacker, along with junior strong safety Brayden Konkol, a Belgrade native who Choate said has already solidified his starting position, did not participate. Both are recovering from off-season shoulder surgery. Other defensive veterans — Choate mentioned senior tackles captain Zach Wright and nose guard Tucker Yates — played minimal snaps. Still, a unit that has received rave reviews from MSU’s coaches and offensive players so far in camp did not show the same assertiveness Choate has seen so far in August. “I thought we were a little sluggish. I really did,” Choate said. “I didn’t think we played with the type of physicality that I want to see and Ty (Gregorak) wants to see from that group. They swelled up and did some nice things in the red zone, but they just didn’t have that spark, that energy that you want to see. Choate confirmed Jonsen and Andersen traded off reps with the first offense but did not go as far as to confirm who was at the helm during the opening touchdown drive. The staff has been widely impressed with Andersen, a do-everything stud from Dillon who was the Big Sky Freshman of the Year because of his ability to play running back and a linebacker as a true freshman. Over the last few days, Choate said he has been impressed with Jonsen’s competitiveness to fight his way back into the competition and with the relationship the competing signal callers have developed. “Travis is not taking his foot off the gas pedal,” Choate said. “He has had to wait his turn for awhile. “But the one thing I think is interesting is that he and Troy have a tremendous amount of respect for each other. I think Travis sees Troy as a guy that could’ve played with him Oregon. He’s very complimentary of Troy’s abilities and his humility. I think Troy is very much drawn to Travis’ confidence. It’s the Ying and Yang, right? Entering Choate’s third year, the Bobcats harbor higher expectations than the last two seasons, a stretch that resulted in a 9-13 overall record for a program that posted 14 straight winning seasons beginning in 2002. 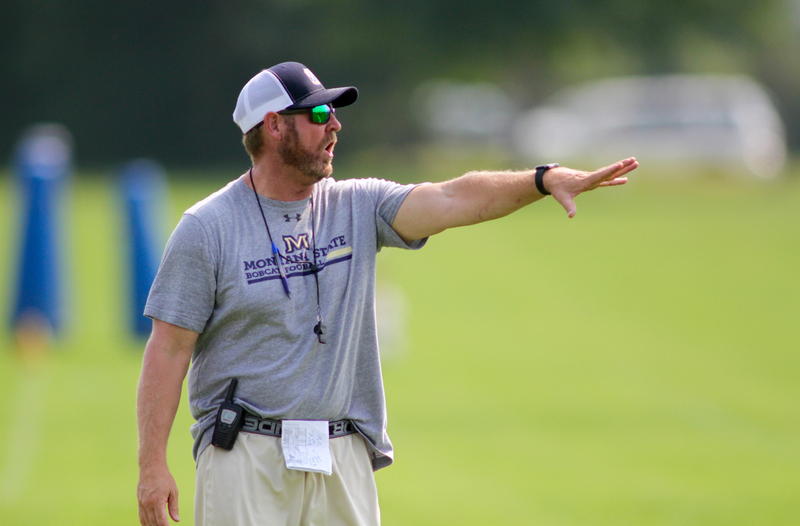 One week through fall camp, Choate likes the progress his team has made. Photos courtesy of Andrew Pedersen, Montana State sports information. All Rights Reserved. RUSHING: Lane Sumner 7-35-0, Troy Andersen 6-16-0, Tyler Natee 4-9-1, Casey Bauman 4-4-0, Tyrel Burgess 3-21-0, Travis Jonsen 3-13-1, Isaiah Ifanse 3-9-1, Shane Perry 3-5-0, Tucker Rovig 3- -2-0, Justin Cauley 3-4-0, Coy Steel 2-11-0, Ruben Beltran 1- -1-0. PASSING: Troy Andersen 4-6-0, 26, 0; Travis Jonsen 1-4-0, 10, 0; Tucker Rovig 10-13-0, 83, 0; Casey Bauman 4-6-0, 19, 0; Ruben Beltran 2-4-0, 10, 0. RECEIVING: Coy Steel 6-59-0, Mekhi Metcalf 4-21-0, Kevin Kassis 2-11-0, Tyrel Burgess 1-5-0, Willie Patterson 1-9-0, Wilson Brott 1-7-0, Shane Perry 1-4-0, Curtis Amos Jr. 1-6-0, Johnny D’Agostino 1-7-0, James Campbell 1-6-0, Clark Judisch 1-7-0, Peyton Hanser 1-6-0.